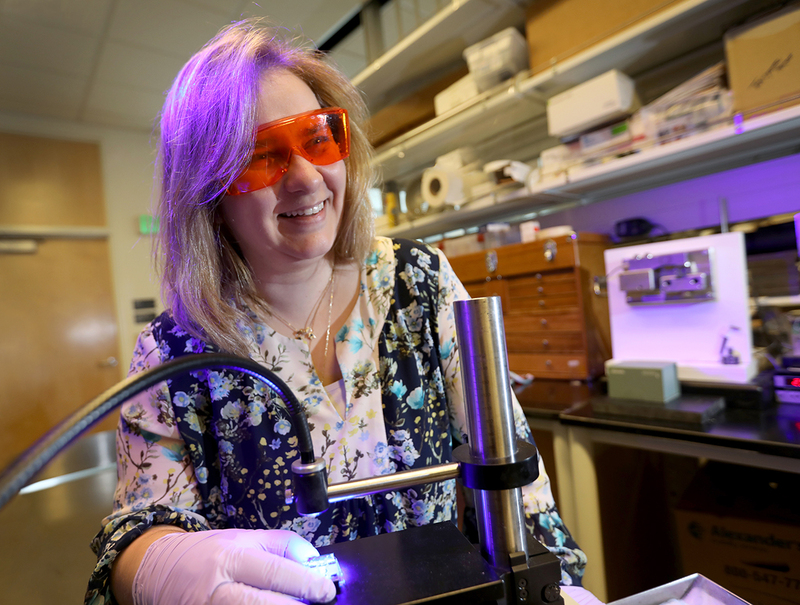 New OHSU research suggests that the risk of developing Alzheimer’s disease is elevated in people with insulin resistance, the effects of which may be ameliorated by a low-fat diet. The study, published in the journal Scientific Reports, was led by Jacob Raber, Ph.D., professor of behavioral neuroscience, neurology, and radiation medicine, School of Medicine, and sheds new light on the shared mechanisms that could explain the overlapping pathophysiology of genetic risk factor and diet. A diet high in saturated fats is a primary contributor to obesity, insulin resistance, and Type 2 diabetes. Both Type 2 diabetes and insulin resistance increases a person’s risk of developing Alzheimer’s disease. Genetic factors, such as the APOE gene isoform e4 encoding apoE4 (E4), also increase this risk. The new findings suggest that diet-induced insulin resistance combined with the genetic risk factor E4 act synergistically to worsen cognitive dysfunction. Isolating the interaction between diet and E4 in humans is challenging due to dietary variations and multiple genetic factors. The team used mouse models expressing human apoE isoforms to examine the co-workings of these genetic and lifestyle factors. 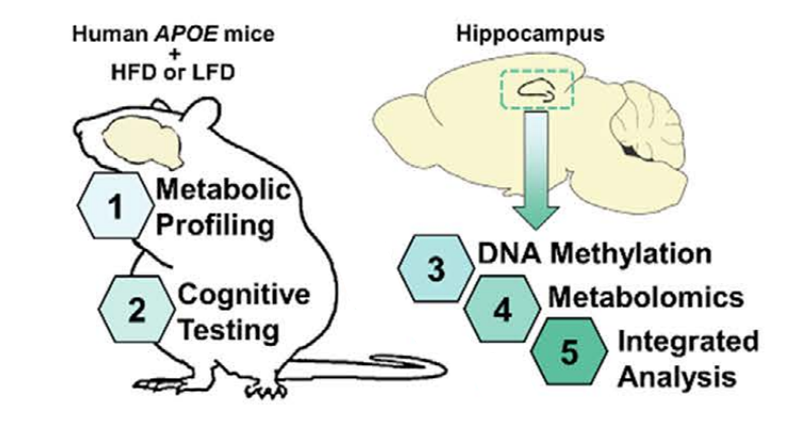 A central question in the study was whether, due to differences in brain metabolism, E4 mice are more susceptible to the effects of insulin resistance than mice carrying E3, a more common isoform of the APOE gene. Both E3 and E4 mice were fed a high-fat diet for five months to induce insulin resistance. Although both groups displayed impaired memory and cognition, E4 mice exhibited significant problems in spatial learning and memory. Raber’s team then identified significant alterations in three essential energy metabolism pathways: purine metabolism, glutamate metabolism, and the pentose phosphate pathway. The results suggest that carriers of E4 are more susceptible to metabolic impairments brought on by insulin resistance, which in turn impact memory. However, the metabolism, memory, and cognition problems caused by the high-fat diet were resolved after the E4 mice went on a low-fat diet for one month. This suggests a functional role was associated with reversal of the three metabolic pathways. The new knowledge may guide development of novel therapies for cognitive decline and dementia, but as for now, a healthy diet is in order. In addition to Raber and lead author Lance A. Johnson, the research team included Soren Impey, Jan F. Stevens, and Eileen Ruth S. Torres. The research was supported by the National Institute of Environmental Health Sciences (T32-ES07060 to L.A.J. ); National Institutes of Health (T32-HL094294), National Science Foundation (SMA-1408653), an OHSU Tartar Trust Fellowship, the Oregon Tax Checkoff Program for Alzheimer’s Research administered by the Layton Aging & Alzheimer’s Disease Center in collaboration with the Oregon Partnership for Alzheimer’s Research, the Collins Medical Trust, and the OHSU development account of J.R.; National Institutes of Health (R21AG043857 to N.A. ); NIH (S10RR027878 to J.F.S. ); and the OHSU Mass Spectrometry Core Facility of the Environmental Health Sciences Center grant P30ES000210.